Epoxy concrete repair methods. 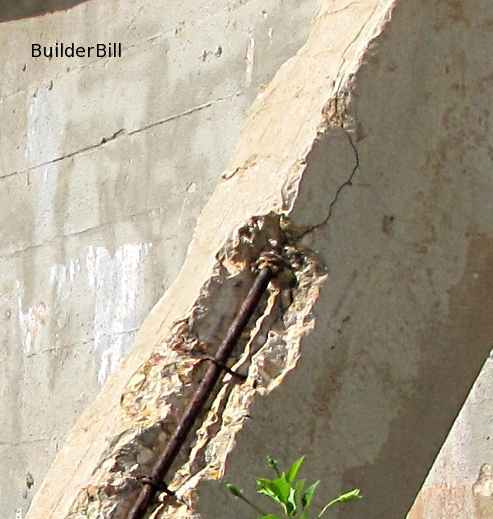 A primer (no pun intended ;-) for repairing damaged concrete..
Epoxy concrete repair - A badly deteriorating concrete buttress to an old water tank. Regarding photo above. It would be a fairly brave man to take on a job of repairing this buttress. OK I have the benefit of seeing the surrounding structure and it does not look good. A typical repair specification may say something like "Cut back loose and damaged concrete to a solid base". What happens is that concrete like this when hit with a demolition breaker or jack hammer will start to show more cracks under the impacts and so it goes on. Many times jobs like this turn into a complete demolition and rebuild. Following on from the previous page I am offering here a few epoxy concrete repair methods that I have used on various jobs in the past. First some background:- I am not a structural engineer so what is contained on this Epoxy Concrete Repair page is in plain non-technical language that may give you a brief overview of this highly complex subject. I have worked with engineers extensively particularly on a few jobs where we had to repair structural defects in concrete. I won a contract quite a few years ago to repair a badly deteriorating concrete slab in the (salt-water) pump-house of our local power station. After completing that work I was asked to quote on quite a few other concrete repair jobs for our local Power and Water Authority. Mainly sewerage pumping stations (where there's muck there's money, lad :-) and the like that were suffering from the effects of long term chlorine use. It must be said that prevention is by far the best remedy. Make sure that your concrete is top quality with none of the defects listed on the previous page. Epoxy Resins (from the Greek epi = upon and oxy = sharp or acidic, and resin as in the substances exuded by trees etc.) were first discovered in the early 1900s, but they were pioneered for commercial use some time in the 1930s culminating in the company Ciba producing the first true epoxy resin in 1946. Waterproofing, sealing or decorative coatings to various parts of a building structure. Abrasion resistance and non-skid coatings and topping to floors. As binders for other materials. For repairing damaged or deteriorating concrete. Advantages of epoxy resins over other method of repairing concrete. A full range of viscosity, from thin very liquid primers and sealers that can permeate the concrete to non-sag compounds for overhead plaster type repairs. Curing can take place in temperatures down to -10C or 14F. High mechanical strength, corrosion resistance and chemical resistance. If defects in the concrete are noticed early on in the process then it may be possible to arrest further damage by simply applying a waterproof membrane. This will require preparing the surface and then applying primer, filling any depressions and holes with a putty like compound and then applying a protective coating. However in most cases that I have come across the damage has well and truly set in and a quick fix is out of the question. To a large extent this major damage will have been caused by lack of maintenance. You can be assured that ignoring these sorts of problems will not make them go away. Remove affected concrete and replace with new concrete. Used on larger areas of damage. Breaking away the concrete to remove all the loose material to expose all of the the rusted rebar that will be cut away and exposing enough good rebar to join new reinforcing steel to. It is usually possible to weld new rebar to the old rather than making a full lap joint in the rebar. This obviously makes to area of removed concrete smaller. In harsh environmental conditions rebar is sometimes hot dipped galvanised. Forming up and pouring new concrete. The bond between the old and the new concrete can and should be increased by coating the old concrete (and possibly the rebar) with an epoxy resin that is said to be hydrophilic, that is it works or has a strong affinity to water. The timing of this has to be perfect as the epoxy binder must be still sticky when the concrete is poured. Many times when doing this, extra thickness is given to the new concrete to provide increased cover for the rebar. When the formwork is stripped (if any) then the surfaces are primed and then coated with epoxy waterproof membranes. Remove affected concrete and replace with an epoxy concrete. Normal concrete uses aggregates water and cement. This epoxy concrete repair mixture consists of the epoxy resin/hardener and aggregates only. The advantages of this method is increased strength and bonding to the original. Also the ability to bond the new repair to the old where it may taper to a very thin edge. The disadvantage is the cost on larger repairs. Break away loose material, clean rebar and replace if necessary. Clean surfaces to be repaired. Prime area and then repair with epoxy concrete. Typically the aggregate is fine, clean sand. Manufacturers sell it in sealed drums and it is said (by the manufacturers) to be coated with various enhancers. I have not been able to see any difference in looks or performance with standard washed sand that is available where I live. It should be sieved with a fine mesh to remove larger pieces and rubbish. The important thing is that it is clean and dry. It MUST be dry to mix well. Horizontal repairs can use a fairly runny mixture of standard liquid epoxy resin and sand as the aggregate. This is poured into the damaged area. Vertical and overhead areas require the used of thixotropic (non-sag) epoxy compounds or binders. In either case the volume of the applied epoxy concrete should not be too great. Typically they are applied in layers making this quite time consuming. The reason for this is that the mixing of the epoxy base and the hardener produces an exothermic (formed with heat) reaction. If this is not controlled then the excess heat can cause problems like accelerated setting times and loss of strength. (I have actually made up a batch of epoxy binder and it was far to hot to hold in it's container and the heat was so intense that the epoxy frothed out of the top and the whole batch was useless). Quite often when the mixture is mixed in something like a plastic bucket, it is then transferred to a paint tray to spread the mixture thinner and over a larger area to slow down the heat build up and the setting time. When using edge forms then the forms faces should be protected with plastic. The surfaces are primed and then coated with epoxy waterproof membranes if necessary. There is a bewildering array of chemicals and waterproofing methods available and none of them are cheap. It is good advice to do as much research as you can before buying any of the high-tech construction chemicals. : NEXT >> Polished concrete floors.